Volketswil, Switzerland: – 2015 is starting for Hapa with a small, but hugely important development: a new logo. 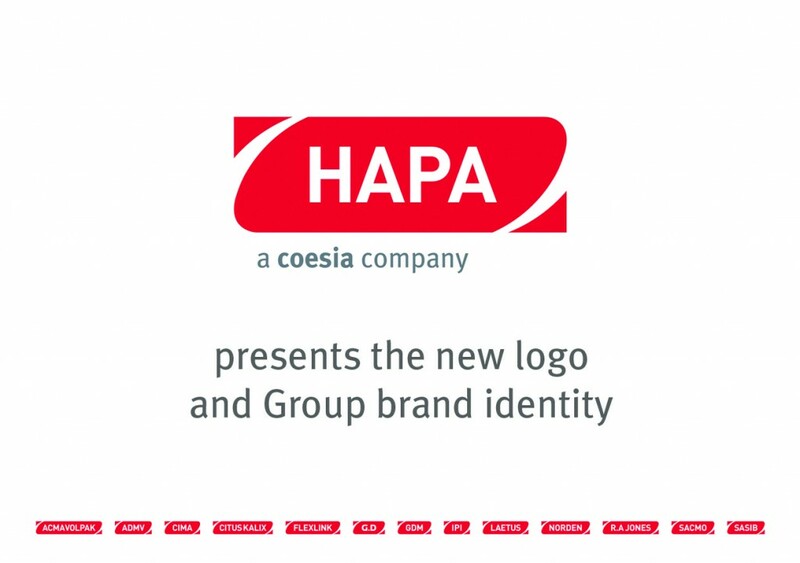 The design change, incorporating Coesia Group and each member company, including Hapa, aims at clearly communicating the connections between the Group and the companies comprising it. Hapa AG is one of 14 innovative companies offering technological solutions that comprise the privately owned Coesia Group, which is headquartered in Bologna, Italy. ACMAVOLPAK, ADMV, CIMA, CITUS KALIX, FLEXLINK, G.D, GDM, HAPA, IPI, LAETUS, NORDEN, R.A JONES, SACMO, SASIB. The Group has 92 operating units (55 of which have production facilities) in 31 countries, over 6,000 employees, and a turnover, in 2013, of approx. 1.4 million Euros. Hapa AG is a global leader in Late Stage Customization and On Demand Packaging print solutions for the pharmaceutical packaging industry, with growing presence in the medical, FMCG and food industries. Its mission is to empower customers to complement lean production with in-process printing solutions. Since introducing its first printing machines in 1933, Hapa has championed innovative printing solutions that can easily be integrated into existing packaging processes. Thanks to its more than 50 years as a partner to the pharmaceutical industry with its strict regulatory environment, Hapa possesses invaluable know-how that translates into highly relevant innovative solutions. Hapa’s printing systems are developed and produced at its base near Zurich, Switzerland. Hapa also has presence in the USA, UK, Germany, India, Mexico, Brazil and Japan, employing some 150 people in all. There are more than 2,000 Hapa machines in service in more than 50 countries worldwide. Click on New Year New Look for Hapa for other information.